Sarah Silverman spoofs Joan Rivers on "Saturday Night Live"
Shortly after Joan Rivers' death on Sept. 4, Sarah Silverman and Jimmy Kimmel paid a fitting, insult-filled tribute to the comedian on his late-night show. 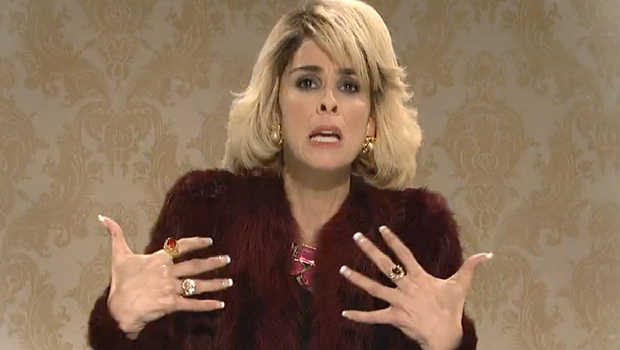 And this past weekend, Silverman channeled her again while hosting "Saturday Night Live." Silverman played Rivers as she continued to keep folks laughing up in heaven. Her audience included other late greats like Freddie Mercury (played by Adam Levine of Maroon 5, the night's musical guest), Lucille Ball, Steve Jobs, Richard Pryor and a very giggly Benjamin Franklin. "Hey Ben, where'd you get that outfit?" Silverman, as Rivers, asked him. "Forever 1721?" You can see her roast the rest of the "guests" in the "SNL" sketch below.